We are authorised Service Agents for the Biolytix BF6 Systems. There is a legal requirement to have these systems serviced regularly and to have a written service agreement with an authorised service provider, should you wish to get your Biolytix system serviced. We recommend servicing every six months so that we can keep a better eye on the system to maintain optimum function. If you have not had a service for some time, then unscrew the access hatch in the centre of the lid and look inside. If there is flooding, little evidence of earthworms, clear blockages of pipework, or bad smells then you do need some work. Please call our office on 9295 6263 to confirm our call-out charges to your area. See our Biolytix Service Procedure for more information, click here. We are finding that, eventually, the Biolytix systems are failing, primarily due to the fouling and sealing of the geofabric filter membranes towards the bottom of the tank. This doesn’t allow water to percolate through into the pump chamber and the tank ‘floods’. ​If you are experiencing any issues with your Biolytix, please contact our office 9295 6263. Submersible pumps (like all pumps) don’t last forever. We expect pumps to last about 2000 working hours, which equates to six to seven years. Some pumps last longer, some less. The quality of effluent severely impacts on pump longevity. Murky water, containing solids of any description, will clog screens, impellors and water transfer ports in the pump. If your irrigation field is buried and does not have any protection from root and soil intrusion then discharged water cannot enter the soil and this puts too much back pressure on the pump. The pump overheats, capacitors fail and damage to the coil usually occurs. Whenever a pump is replaced we also replace the activation float and install a 400 µm filter. We have found that float switches sometimes fail. There are two floats – one to activate the pump and the other for pump failure (high water alarm). If your system has been operating for five or more years, and the pump is replaced, then it is wise to replace the float at the same time. 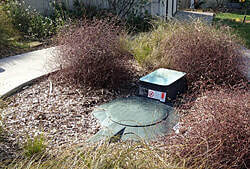 A filter near the tank will reduce sediments traveling to the irrigation zone. Furthermore, whenever the membranes are punctured, when a breather tube is installed, more sludge will move into the pump chamber. This may start to clog the pump and irrigation. Pumps need more frequent removal and cleaning and additional irrigation has to be installed to ensure that the water can be discharged. As a consequence of breather tube install or a pump replacement we insist on servicing every six months, a filter installation and an irrigation extension. Pumps normally have a two year warranty, so if there is a manufacturer’s fault it will be replaced. However, the cost of labour to remove the existing pump and install a new one is borne by the homeowner. If a pump fails within the two years due to clogging of any sort, then the warranty is void. It is essential to maximise the life of your pump by frequent servicing, cleaning the filter and irrigation extension. You need to clean the filter every month or more frequently if you find clogging occurs rapidly. The irrigation extension involves tapping into the existing line with a tee piece fitting and running a 10 m purple poly line into a nearby garden. Three or four lengths of dripline are inserted in the header pipe and these spread into the garden area or around trees. A manual flush valve, covered with a spotter box, is installed at the end of the line – to enable you to occasionally flush soap scum and sludge from the header line. Click here for our Service Agreement form - Perth Metro area (up to 70kms from our home base in Mundaring). Click here for our Service Agreement form - Greater Perth Region (up to 200kms from our home base in Mundaring). Please complete and sign your Service Agreement form then submit to us. ​For those who have a telemetry alarm system, we can now install an external audio visual alarm to indicate pump or system failure. Click here for more details. ​We are finding many systems are flooding due to the clogging of the geofabric membrane. We now can puncture this membrane and insert a breather tube and re-direct air from the blower in an effort to ensure optimal operation. Click here to find out more. ​Please click here to obtain a copy of the Biolytix BF6 Owner's Manual.